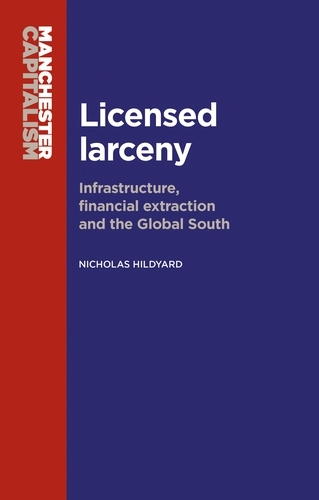 Nicholas Hildyard has authored an interesting book titled “licensed larceny”, the theme being “infrastructure, financial extraction and the Global South”, intending to “mise-en-scène” (arrange on stage) the injustices of wealth; published by Manchester University Press in 2016. Million-dollar question is how can people/entities be licensed for larceny! That too licensed by the very government of a country! The author has elucidated his theme in a very interesting manner. The objective of this article is to see if licensed larceny exists in Nepal. The author mentions a number of bases to arrive at the inference. However, due to time/space constraint only a few bases are reviewed in this article from Nepal’s perspective. The wage differential ratio of CEOs and lowest salaried employee till 1970s was 20:1 but now it has increased exponentially to 300:1. Even in Nepal the ratio is over 210:1 (lowest salary is around Rs 10,000 a month while highest is over Rs 2 million/month). It is amazing that all this is happening with benign blessing of government/s, including in Nepal. The question author asks is: is such an activity licensed by governments? The author, looking at “western” economies, says that “private rate of return on capital tends to be significantly higher for long periods of time than the rate of growth of income and output” of respective economies. “Private wealth grows at 5% but the economy grows only at 1% - the rich have gains of 4% which they can use to make more wealth.” In Nepal’s context wealthy become wealthier by around 9 to 10%, while economy has been slugging around at less than 5%. Clearly, filthy rich are becoming richer (or rather filthier!) by day while unfortunate poor are struggling to make two ends meet day in day out. This snowballs over time as the wealthy become “more dominant over those who own nothing but their labor – the past devouring the future.” Effectively, those that own just their labor get bilked by the wealthy. The author also opines that “rich are rich largely because they have inherited large fortunes.” But it is not universally true and there are a few self-made multi-billionaires too. But these people didn’t make money out of thin air. It would not be absolutely incorrect to see the role of licensed larceny in amassing such fortunes over an extremely short span of time. While the oft-repeated cliché is “be patient, a rising tide will lift all boats,” (this is how “have not’s” have been consoled, but almost one-half of the world population of 7 billion don’t have “boat”! Thus the “boat-less” people will be drowned by the rising tide, instead. The author comes down heavily against PPP (public private partnership) mechanism, which has become latest fad, including with multilateral/s, as investment modality, which effectively becomes toolkit for licensed larceny. PPP is a modality to attract private money in partnership/collaboration with public sector. It is truly an effective mechanism to mobilize funding, especially to set up industries and construct infrastructure. But most of the time “public is private and private is public”. In other words, “what appears to be ‘private’ is in fact public or quasi public.” The term ‘public’ not only encompasses public sector (implying government) but also, unsuspecting, general public. In the name of roping in investment from general public, the promoter/developer would collect money from general public and use it as their own. The exposure to risk falls on the general public while benefit get skimmed by the private promoter/s who retain control over management. Private begins with experience and public with money and in the end public become experienced having lost money and private laughs all the way to the bank. The point can be elucidated by citing a specific case. There was a spinning Mill in Nepal’s mid-Tarai that manufactured and supplied textile yarns (PSY, P/V, ASF and cotton yarns); established in 1989 and liquidated in 2012. In early 90s it had ordinary equity of Rs 127 million and Rs 67 million in preferred equity. In 1994 loan from consortium of banks in Nepal stood at Rs 257 million while Asian Development Bank (ADB) had loaned Rs 109.8 million. Similarly it had raised 14% Debenture of Rs 8.26 million and Rs 15% debenture of 6 million; totaling Rs 14.3 million. In total the Mill had mobilized over half a billion rupees from public and quasi-public sources. Subsequent to its liquidation almost all banks in Nepal (members of the consortium) and ADB were forced to write off outstanding loan and most of the general public shareholders and debenture-holders lost almost all of their money invested in the Mill. It has been reported that a new company incorporated by same promoter (a renowned business house) succeeded to buy all fixed assets of the Mill inter alia land, factory premises including other buildings, plant machinery, equipment, etc. at rock bottom price and a new Mill was established in the ownership of same business house. In sum “public” ended up holding scraps of paper not worth the paper it is printed on and the business house creamed off everything else. The business house now is wealthier while general public owning shares and debentures lost their savings. Similarly, with banks writing off loan, the owners/depositors of such banks got creamed off. Further, ADB having to write off the loan implies that the fund that would have been available for poverty alleviation of actual poor ended up alleviating “poverty” of a rich business house. This is a typical case of “public” [(1) general public, (2) private sector banks holding deposit of general public and invested in by general public and multilateral financial institution (ADB)] being exposed to all risk and bearing all such risk while the private sector ends up sitting pretty. The toad’s eye perspective would be public impoverished due to this Mill and the private “investor” actually enriched. It is sort of norm for private investor to use public fund and profit therefrom without investing their own money. But in this instance the private “investor” not only used public fund effectively to successfully “run” down the Mill but also ended up owning the Mill comprising landed property, equipment, plant machinery, etc. free of workers that supposedly created problem in operating the Mill. An excellent example that defies figure of speech that "You can't eat your cake, and have it too." There are other modalities of how private sector piggy backs on public resources and skims off. Typically public sector would be made to invest in kind, mainly in real estate (land), and private “investor” would use such “property” as collateral to borrow to finance the venture; private investor effectively/successfully avoids exposing itself to risks. In several cases real estate put in by public sector as equity investment in kind is used to borrow money to build factory premises/building, which again gets mortgaged to borrow money for equipment against which also loan will be taken for working capital. Private sector would further leverage to mobilize additional fund by floating share, ordinary/preferred, and raising bond/debenture etc. as well, to cast the net wider. Next part of the story would be if such a venture bites dust the public entity investing in kind would lose its landed property, while private “investor” would simply dust off and move on without a dent (also keep what it skimmed off in the interim). 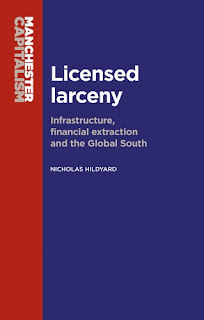 Mr. Hildyard also is not too kind to use of infrastructure as a mean of financial extraction. With the liberalization of hydropower sector in Nepal in 1992 a number of independent power producers (IPPs) have built hydropower plants in Nepal. Himal Power Ltd. (HPL) is the pioneer in this field which has built hydropower plant (60 MW) on Khimti River, which has been in the eye of storm due to things like revenue stream based on contract energy, sovereign guarantee, take or pay contract etc. incorporated in power purchase agreement (PPA). GoN had awarded license to HPL to build, own and operate the plant and is required to handover the plant after license period. Although HPL is a public limited company, it doesn’t make its financial information public; taking advantage of the fact that it is a closely held company as it has not raised share capital from general public. Therefore, there is no way to ascertain how well it is performing. There is an indirect way to assess its performance. Butwal Power Company has invested Rs 434.93 million in equity in HPL (about 17%) and in 2015/16 it received a dividend of Rs 531.77 million; a handsome return on investment of 122% (a hundred and twenty-two percent! Wow!!). Other main owners of HPL are Norwegian: Statkraft owns 57% and BKK 26%. As Statkraft owns 49.9% of BKK (rest owned by 17 municipalities), Statkraft effectively owns almost 70% of HPL. As the Norwegian investors have invested in HPL in convertible currency and, therefore, the rate of return would be a little lower compared to BPC due to devaluation of Nepali currency. The question that begs answer is, does such a high return on investment amount to being unconscionable, hence “financial extraction” in the context of “licensed larceny”? HPL earns its profit by selling electricity to Nepal Electricity Authority (NEA) under PPA signed in March 1994 (amended in January 1996), which has been roundly condemned by all concerned and it was asserted that NEA is bearing huge financial burden due to the PPA and incurring loss. The PPA is denominated in US dollars, subject to tariff escalation based on consumer price index (CPI) of New York, USA and protected by “change in legislation” provision that insulates HPL from increases in tax rates in Nepal. Further, NEA is required to buy all power according to contract energy schedule irrespective of whether it can use/sell; it still has to pay if it is not able/willing to receive power (in early 2000 NEA had to, reportedly, shut down its power stations that generated cheaper power to enable it to buy power from HPL). This certainly looks like best one-sided deal of record. Licensed larceny is not limited to manufacturing and infrastructure sector. It is rampant everywhere in Nepal; highly pervasive too. To illustrate, gold and silver jewelry sellers cheat both on quality and quantity. Adulteration of petroleum product and short supply thereof is the norm at every stage: transportation, storage and distribution. The list is very long. But what takes the cake is the fact that if state/regulator takes action against such activities, the larcenists blackmail the consumers as well as the state and force to “surrender”. Therefore, these are turning into state sanctioned larceny.